If the bull case revolves around QEII and low rates, than inflation is a threat to the bull case. The ISM Prices paid component came out above 70, which is very hot. The recent surge in commodity prices does not help either. 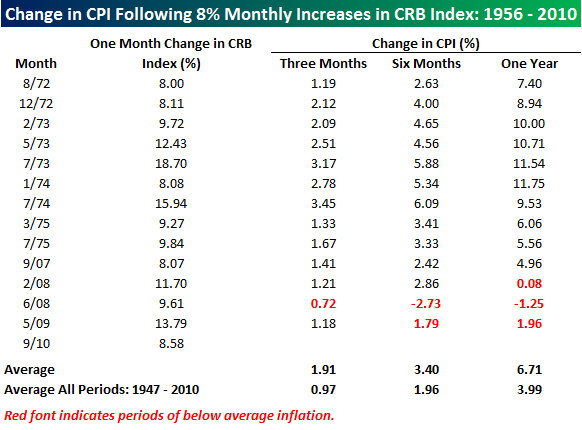 The study below from Bespoke shows that spikes in commodity prices have generally been followed by higher CPI inflation. It seems the only time that higher inflation has not followed a surge in commodities was in 2008 when we were seeing a blow off top and commodity prices completely collapsed afterward. 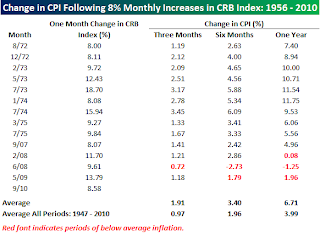 Unless commodity prices collapse odds are that we will see a higher CPI in the coming months. The heavy freight division of UPS says it will raise rates by 5.9 percent on Oct. 18. ...On Wednesday, FedEx Corp. said its freight and national less-than-truckload units would raise rates 6.9 percent starting Nov. 1. Heavy-equipment maker Caterpillar says it will raise prices up to 2 percent worldwide starting in January... The company has already announced its first emissions-related price increases of 2 percent to 6 percent. Those also take effect in January. The cost of a 31-item basket of goods at a Wal-Mart in Virginia was $95.75, a 2.7 percent increase from August and a 5 percent gain from the start of 2010, analyst Charles Grom said today in a report. The price is the most since the New York- based analyst began the survey in January 2009. The Wall Street Journal has an article out about retailers and manufacturers trying to pass on higher costs. Taschy -- you are right on with this call. I am starting to see signs of inflation in the markets and will also post if I see this developing further. I dont know where you stand on Gold but I just posted this thinking paper -- let me know what you think. Happy trading. Excellent list. I would probably own some gold if I were wealthy as a hedge. Right now I need all my capital for trading.